Memorial Day Weekend Double Header! Double-header weekend this Saturday, May 26 and Sunday, May 27 at Cochran Motor Speedway! We will be making up features from earlier this month and running a second feature for those drivers on Saturday night! Plus, racing in all other divisions! This Saturday, May 26, we will complete the following rained out events from May 12. Race For Texas This Saturday Night! Winter Shootout Resumes for the NeSmith Dirt Late Model Series March 10th and 11th at Cochran Motor Speedway in Cochran, GA! SOUTHERN THUNDER LATE MODEL SERIES: 60 LAPS $10’000.00 TO WIN. FOR ALL RULES PERTAINING TO STLM PLEASE CONTACT BEN SUMNERS AT 229-406-2167 CHEVROLET CT 525 ENGINES ARE ALLOWED FOR THIS SERIES. FRIDAY OCT 21ST: PRACTICE IN ALL CLASSES FROM 7:00PM TO 10:00PM. PIT GATE WILL OPEN AT 6:00PM. GENERAL ADMISSION TO TRACK WILL BE $10.00! SATURDAY OCT 22ND: HEATS AND FEATURES IN LAST AIR & ELECTRICAL JR. ENDURO, MULE HIDE PRODUCTS BOMBER, HEARTLAND EMS PURE STOCK, CENTRAL GA AUTO SALVAGE SUPER STREET, BALDWIN BUILDERS SPORTSMAN & JOHNSON RECYCLING LATE MODELS! OCTOBER 22nd GA STATE CHAMPIONSHIP! BRING THE WHOLE FAMILY FOR SOME GREAT RACING ACTION. CAMPING IS FREE! LAST AIR & ELECTRICAL JR. ENDURO, MULE HIDE PRODUCTS BOMBER, HEARTLAND EMS PURE STOCK, CENTRAL GA AUTO SALVAGE SUPER STREET, BALDWIN BUILDERS SPORTSMAN AND JOHNSON RECYCLING LATE MODELS. 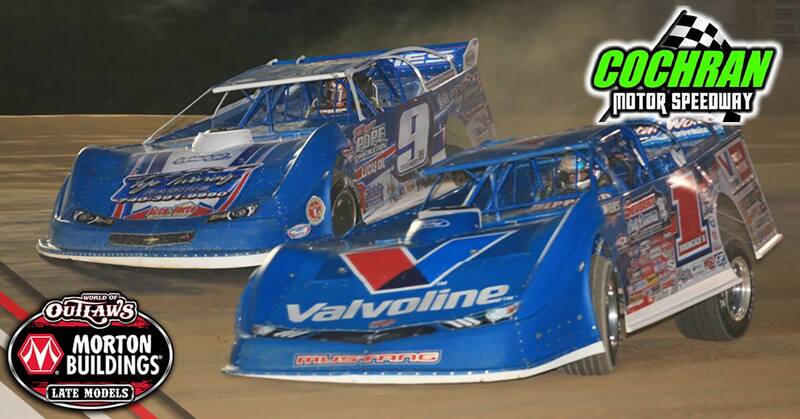 ATTENTION LATE MODEL DRIVERS: WE WILL RUN BY SOUTHERN THUNDER LATE MODEL RULES AND WEIGHTS! 3RD ANNUAL GA SHOWDOWN EVENT DETAILS FOR JULY 2ND AND 3RD! DON’T MISS OUR PRE-RACE CEREMONY AS WE SALUTE OUR MEN AND WOMEN THAT HAVE SERVED IN THE MILITARY! LARGE FIREWORKS SHOW ON SUNDAY AT INTERMISSION! SATURDAY- HEATS AND QUALIFYING IN ALL CLASSES PLUS CENTRAL GA AUTO SALVAGE SUPER STREET FEATURE $1000.00 TO WIN AND PRACTICE FOR JR ENDURO.